OPELON Stretch Fibrous Silicon White 0.7mm, 25 meters. This is a flat, fibrous cord, which does.. STRETCH MAGIC Black Elastic Cord 0.8 mm 5 meters. Stretch Magic is strong, durable, non-fraying and ..
Great for beaded bracelets, can be knotted - use a dab of epoxy resin glue ( devcon / araldite ) for.. STRETCH MAGIC Clear Elastic Cord 0.5 mm 10 meters. 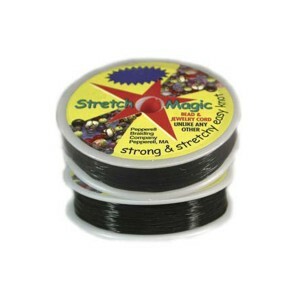 Stretch Magic is strong, durable, non-fraying and..
Great for beaded bracelets - can be knotted - use a little dab of epoxy resin glue DEVCON to seal an.. STRETCH MAGIC Clear Elastic Cord 0.7 mm 25 meters. Stretch Magic is strong, durable, non-fraying and.. STRETCH MAGIC Clear Elastic Cord 0.8 mm 25 meters. Stretch Magic is strong, durable, non-fraying and.. STRETCH MAGIC Clear Elastic Cord 0.8 mm 5 meters. Stretch Magic is strong, durable, non-fraying and .. STRETCH MAGIC Clear Elastic Cord 1.5mm 4 meters. STRETCH MAGIC is strong, durable, non-fraying and w.. STRETCH MAGIC Clear Elastic Cord 1.8mm 3 meters. STRETCH MAGIC is strong, durable, non-fraying and w.. STRETCH MAGIC Clear Elastic Cord 1mm 25 meters. STRETCH MAGIC is strong, durable, non-fraying and wi.. STRETCH MAGIC Clear Elastic Cord 1mm 5 meters. STRETCH MAGIC is strong, durable, non-fraying and wit..